Callum made the first independent break. He headed out by himself at 8:30 to track down some bread for breakfast. The task was slightly harder than it might otherwise have been as almost all shops here in Sancerre close on Mondays. He successfully found the only open boulangerie, performed the shopping in French and, importantly, navigated his way safely home. That’s the sort of learning experience that you tend to hope for when you’re planning long-term travel, so it was lovely to see it come off. It was also lovely to see his pride in the achievement. Next issue: Declan wants to try tomorrow. On the road down from Sancerre looking back. 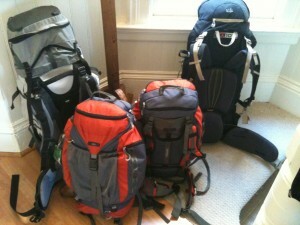 After lunch Jennifer and the boys went to their first French lesson and I set off to ramble about the countryside. It was absolutely idyllic. The sun came out today and it is really warm. Walking through the vineyards down the hillside towards the Loire I was surrounded by silence broken only by the singing of birds. There wasn’t another person to be seen anywhere. As you’d expect in a region so significantly devoted to wine, all the hillsides are covered in vineyards. This early in the year they are a mass of wires supporting bare branches, but the sides of the fields are breaking out in wildflowers and there is a forest in the distance on the Loire’s West bank. 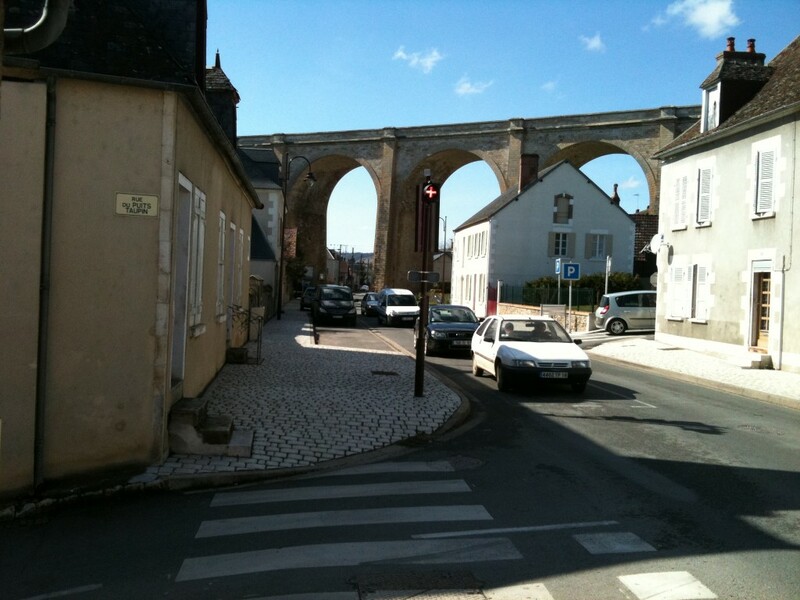 At the bottom of the hill, I came to the town of Saint-Satur. I must admit I don’t understand the economics of little towns like this, but it fascinates me. Saint-Satur is clearly a farming town. There are several huge earth mover dealerships, a couple of vets, a place selling animal food and two huge grain elevators which look like they’ve seen better days. But walking up the main street I counted five hairdressers in one 50m stretch. I mean how much hair is there to be done in a small town? a lock gate there holding the waters a good 7 or 8 metres above the level of the Loire. The side canal was parking for quite a few houseboats of various types, although I couldn’t for the life of me see how they got in and out. 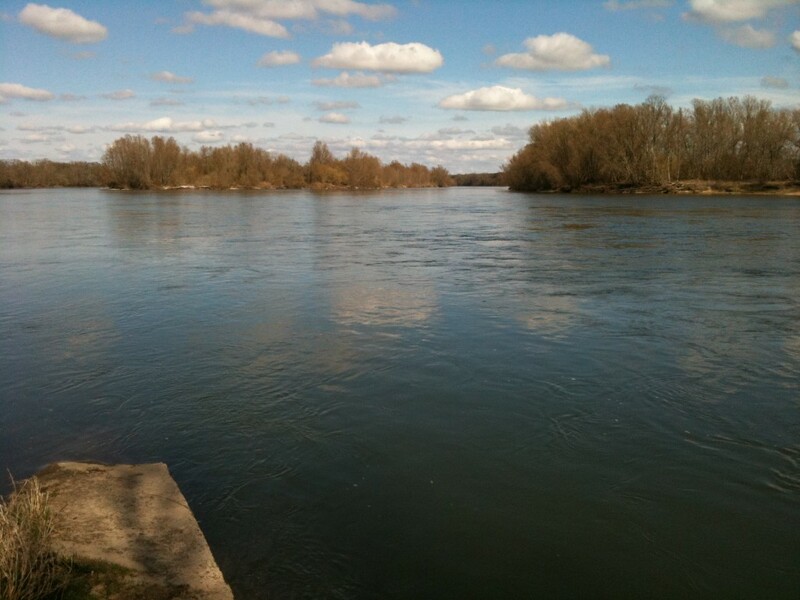 The Loire itself is much wider than I expected and flows along at a significant rate. There’s a lovely path along its banks which will merit a further investigation in the coming days. 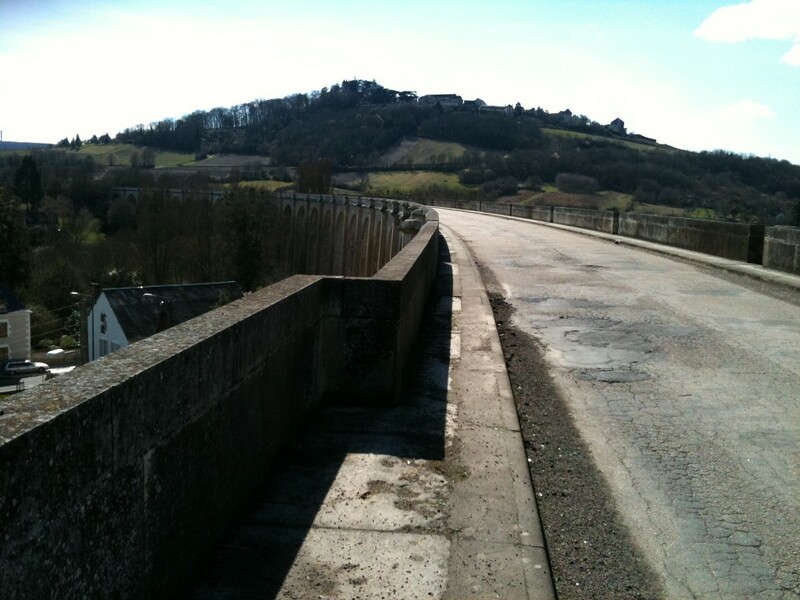 On top of the viaduct looking back to Sancerre. lack of traffic on my walk today was typical. But I was quite happy standing in the middle of the road to take pictures. From the viaduct I walked further West with the aim of getting round to the far side of the hill upon which Sancerre sits. Again for quite some time I saw no one else around. Then I came across a charming little restaurant with chairs clustered around a huge tree beside the river and then, finally, a cluster of more plebeian businesses around the local supermarket. 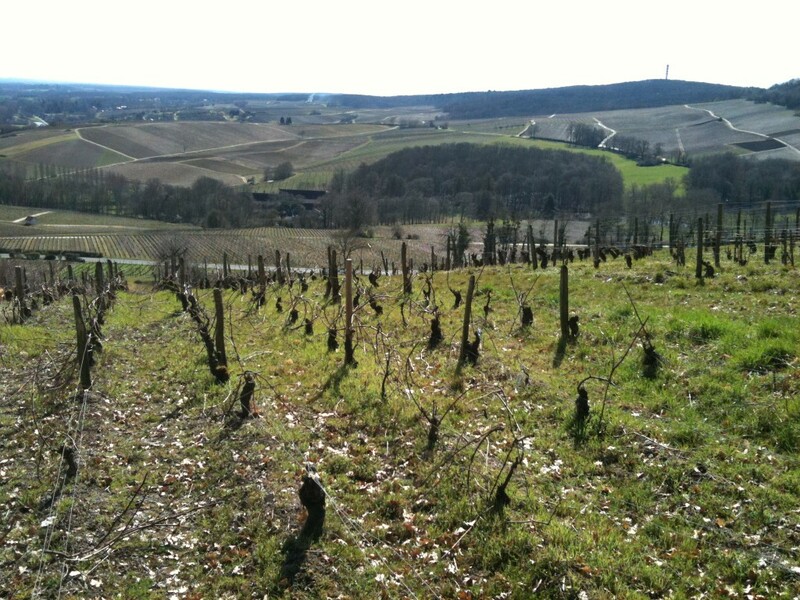 After stocking up on groceries I headed back up to Sancerre. 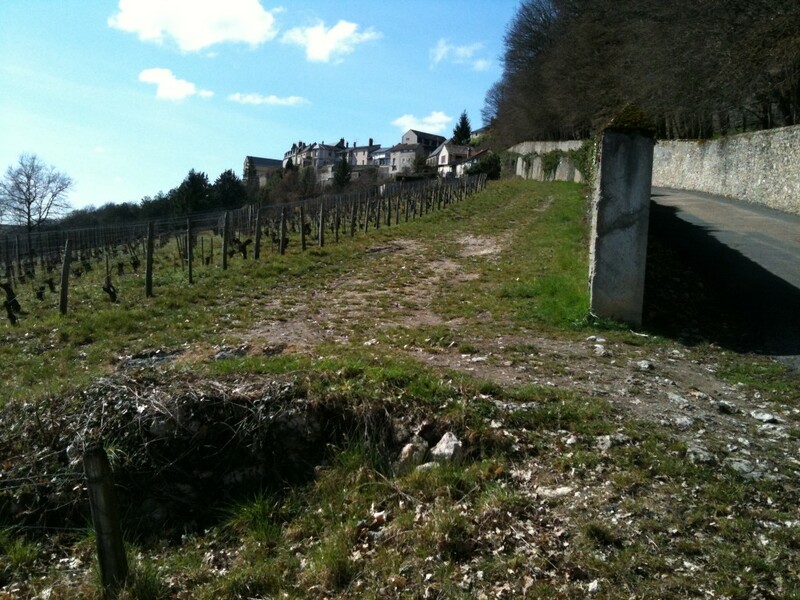 I just checked and Sancerre is just over 300m above river-level. Regardless, the walk back up today in the shining sun passed much more quickly than the same route in the rain yesterday. 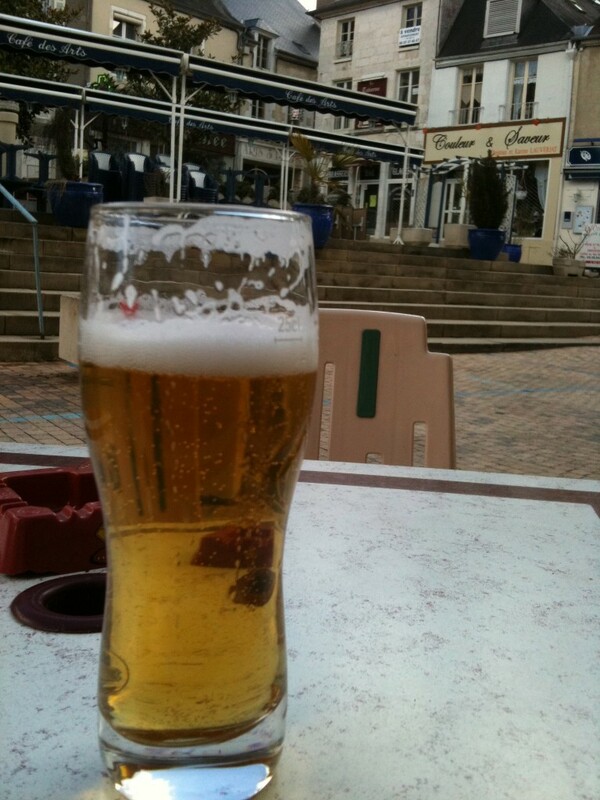 To reward my efforts I sat and had a beer in the town square and watched the falcons wheel over the ancient tower that is Sancerre’s only remaining bit of fortification – the rest having been demolished in the 15th Century to prevent the locals from rebelling. Just me, the man behind the bar and the birds. And the occasional local farmer strolling past with a muttered ‘bonjour’. All in the sun. And that, my friends, is a good day.